Place of birth: Scottsbluff, Nebraska, USA — I was raised on a farm nine miles east of town. I had an incredible childhood. Overseas history: South Korea (Jeonju, Seoul, Jeonju, Seoul): 2006-08; 2008-09; 2010-11; 2011 – present. Occupation: National editor for the Korea JoongAng Daily, an English newspaper in Seoul; and author of Trans-Siberian, a travelogue about a trip on the the world’s longest railway. Cyberspace coordinates: Bart Schaneman (Tumblr blog) and @bartschaneman (Twitter handle). What made you abandon your homeland for Korea? I left because I wanted experiences. I wanted material to write about. I wanted to travel and get out of America. I didn’t want a mortgage. I didn’t want to get trapped. I didn’t want to wait until I was too old to see the world. Was anyone else in your immediate family displaced? I’m the only person in my immediate family who doesn’t live in the region called the Great Plains. Tell me about the moment during your stay in Korea when you felt the most displaced. I don’t really have a moment like that. Korea’s an exceptional place. It’s safe. The people are kind and educated. It gets easier to live here as a Westerner all the time. I’m here by choice — it gets lonely, and I miss my family, but I don’t really question why I’m here. There were minor annoyances about how things are done differently than what I was used to when I first got here. I don’t really notice those anymore. People here move to their left on the sidewalks. That’s not too hard to get used to. When did you feel the least displaced? Every time I go home I remember how lucky I am to live in a foreign country. Not that Nebraska or the Midwest is a bad place. I love it and I hope I’ll be lucky enough to get to live there again someday. It’s just very familiar. Difficult to find interesting. In Asia, I’m rarely bored with my surroundings. I value that more and more as I get older. Kimchi. But only from Korea. It’s not right anywhere else. We are therefore looking forward to the meal you are invited to prepare for Displaced Nation members, based on your travels. What’s on the menu? I’m going to serve you all a bowl of chamchi kimchi jjiggae: tuna and kimchi soup. It will make you feel like you can flip over cars after you eat it. Great when you’re sick or hungover. And now can you offer a Korean word or expression for the Displaced Nation’s argot? The most important word to understand in Korean culture, to my mind, is jeong. It doesn’t translate directly, but the closest way to describe it is as a type of deep bond that is formed between people over time that helps you care for someone. You might not see an old friend frequently any more, or you might not be romantic with your partner, but you have jeong for them so you still want to help them when they need you. It explains a lot about the Korean mind and Korean society. Earlier this month we did a poll on expat voting. Do you still follow your home-country politics? I work as a journalist so I pay attention to American politics. Koreans pay attention as well. I’ve heard it said by people here that when the U.S. coughs the whole world gets sick. Most of my co-workers are from the U.S. and very well informed. Do you vote despite living abroad? I vote when I like the candidates, but I don’t vote if I don’t like what’s offered. Were you surprised at the 2012 outcome? I’m always surprised at how divided America seems around election time. People I love and trust can think about the world in an extremely different way than I do. That’s more surprising to me than who won the election. The American Thanksgiving took place last week. What do you feel most thankful for in your life right now? I’m lucky to have the life I have. I’m healthy. I’m alive. I don’t need much more than that. No complaints from me. 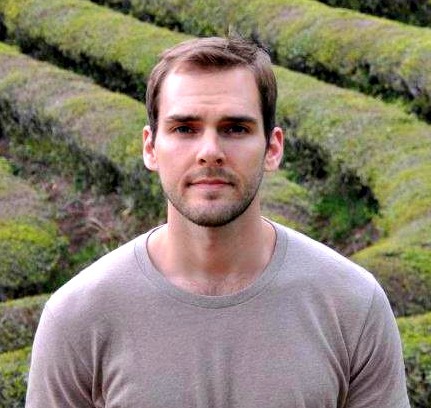 Img: Bart Schaneman in the Boseong Tea Fields in Boseong, South Korea (May 2011). Overseas history: Italy (Marina di Pisa, Livorno, Rome): 1969-70; 1970-71; 2002 – present. Occupation: Crime Writer. My protag is an Italian American journalist rebuilding a career as a food writer in Italy. She first appeared in “Feeding Frenzy,” one of the mystery stories in Fish Tales: The Guppy Anthology, edited by Ramona DeFelice Long (Wildside Press, 2011). She’s waiting in the wings in an as yet unsold manuscript, set in Rome. She will solve another crime in the novel I’m beginning next week (for National Novel Writing Month), set in Florence. Cyberspace coordinates: Italian Intrigues — Notes about life in Italy, food and wine, mysteries and crime (blog); Novel Adventurers — Seven writers blog about their passion for culture, travel, and storytelling (collaborative blog); @patriciawinton (Twitter handle); and Novel Adventurers (FB page). What made you abandon your homeland for Italy? I had the opportunity to come live in Italy when I was quite a young woman, and I lost my heart to the land, the people, and the cuisine — not to mention the wine. I talked about coming back to live for years, but life intervened. Following 9/11 (I worked a block from the White House at the time), I really felt my mortality and decided it was time to make the move. Or to stop talking about it. Tell me about the moment during your various stays in Italy when you felt the most displaced. “Bureaucracy” may be a French word, but the Italians invented it. If you don’t believe me, I invite you to consider the Biblical story of Christmas: a decree went out from Caesar Augustus that all the world should be taxed, each to his own city. Getting together the paperwork to file for permanent residency was a nightmare. After almost a year of compiling documents, it all came down to what the Italians saw as a discrepancy: my passport lists my place of birth as Tennessee while my birth certificate, issued by the state of Tennessee, listed my place of birth as Pelham. Getting that sorted out took six months. During the interregnum, every document including my permission to stay expired. I couldn’t renew anything until the residency question was settled. It’s always at table. On the edge of a Tuscan vineyard enjoying homemade pasta and good wine, sharing laughter with friends. Before a roaring fire in a chilly stately home with simple chicken and salad, but more laughter and wine. With a group of strangers in at a local market luncheonette, querying a table-mate about her meal and being offered a share. A morsa di prosciutto (prosciutto holder). While most prosciutto crudo sold in Italy as elsewhere is machine-sliced, traditional purists want it cut by hand. To hold the ham steady, it’s placed in the morsa, a large clamp that hold it, while a knife is used to slice. Hmmm… I hope it won’t be deployed by the murderer in one of your crime novels as an instrument of torture! I understand that when you first went to Italy, you learned to make pasta by hand, and then took a pasta machine back to the United States, where you taught many others how to make it, while also writing a food column for a newspaper. We are therefore looking forward to the meal you are invited to prepare for Displaced Nation members, based on your travels. What’s on the menu? And now can you please suggest an Italian word or expression for the Displaced Nation’s argot? One that I’m currently enjoying is in gamba, meaning “in the leg.” In general, it means “to be an expert” or “to be good at what you do.” But it means so much more. I wrote an extensive piece about the phrase at Novel Adventurers recently. Halloween is nearly upon us, and many of our posts of late have been about horror and that sort of thing. Tell me, do you keep up American Halloween celebrations in Rome? I haven’t really celebrated Halloween since I was a child. I spent much of my adult life working on political campaigns. With Halloween falling days before the election, I never seemed to get organized for it. Here in Italy, it’s a relatively new holiday and more for adults than children, really. Children dress up for carnival, wearing their costumes to school for days before Martedì Grasso (Italian for Mardi Gras). There are Halloween-related items for sale (plastic Jack O’ Lanterns and such), but no pumpkins for making Jack O’ Lanterns. Those are reserved for cooking. If I do anything to celebrate, I cook pumpkin, either as a vegetable or as part of the primo piatto. Also in keeping with the season, we’ve started exchanging expat horror stories on the site. What’s the creepiest situation you’ve encountered on your travels? The creepiest thing that ever happened to me occurred many years ago on a train from Munich to Florence. It started off pleasantly enough. I shared a compartment with five or six other people. A couple of them spoke only German. One woman spoke Italian and German, a man spoke German and English, and I spoke English and Italian. We had a polyglot conversation, with people translating for others and listening to see how much of the foreign tongues we could decipher. It was lots of fun. They all left the train before I did, and each warned me to be careful on my long journey as they descended one by one. Alone, I moved near the window, and the rocking of the train lulled me to sleep. Quite some time later, I was awakened by the conductor turning on the lights to check tickets. I discovered that I had been joined in the compartment by a man who was in the act of pleasuring himself in the dark while I slept. STAY TUNED for tomorrow’s post, another horrifying Displaced Q by Tony James Slater! Today we welcome Sonia Taitz to The Displaced Nation’s interview chair. 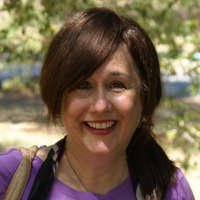 Sonia is an author, playwright, and essayist; her writing has been featured in publications such as The New York Times, The New York Observer, and O: The Oprah Magazine. She is also a regular guest on NBC’s TODAY show, CNN, and National Public Radio. A heartbreaking memoir of healing power and redeeming devotion, Sonia Taitz’s The Watchmaker’s Daughter has the dovish beauty and levitating spirit of a psalm…A past is here reborn and tenderly restored with the love and absorption of a daughter with a final duty to perform, a last act of fidelity. Intrigued? So were we. You’ll be happy to hear that Sonia has agreed to participate in this month’s prize draw, and has let us have a copy of The Watchmaker’s Daughter for October’s giveaway. See the end of this interview for details of how to enter the draw! But now, over to Sonia. Sonia, welcome to TDN. Could you tell us a little about your early life? I was born in New York City. My parents had emigrated here from Germany, where they lived as displaced people after World War II. And what was your parents’ reaction when they first arrived in America? How did the country make them feel? They felt they had found refuge and harbor at last. When they saw the Statue of Liberty, they understood, for the first time in their adult lives, that they could be safe in the world. Growing up in America must have been full of cultural contradictions for you. As a TCK and child of Holocaust survivors, did you feel at home in or removed from American culture? Both. I felt American in contrast to my parents, to whom I had to translate things big and small (various cultural revolutions; why you don’t wear socks with sandals). At the same time, I felt different from American children whose parents were not from somewhere else. There was a deep rift between the “light” attitude shown on television (my strongest link to the culture) and the serious and weighted way my parents tended to see the world. I lived on both sides of that rift. Sometimes it was tiring; sometimes it was exciting. You helped your parents get over their trauma of being in the concentration camp through travel. Where did you go, and how did you react to the other cultures? I left my safe milieu in NY (we lived in a cozy Jewish immigrant neighborhood) and crossed the Atlantic to the Old World, Europe. My parents had experienced deep and savage hatred in Lithuania, under the Nazi regime, and both had survived ghettos and concentration camps. They had seen neighbors turn their backs on them, or even turn against them. To my parents, America was free of these horrors. Here, everyone had a chance. Here, no one could ever round you up and kill you. Europe, they felt deeply, was a checkerboard of blood-hatreds, and they had rejected it as much as it had rejected them. So that’s where I went at 21, sure that the world was no longer as bad as they had thought – that it was, in a sense – safe to trust again. You might be wondering how all this was helpful to my parents. The story is told in my memoir, The Watchmaker’s Daughter, but the upshot is, I married the Englishman, and everyone ended up happy ever after. You say your journey centered on Oxford, England — in fact, you did a degree at Oxford University. How did you find living in the UK, and what were the biggest adjustments you had to make? I loved it and I hated it. There was no place more seductive, in the sense of misty fog, the flowing river Isis on which proud swans drifted, dreamy willow trees and – on the inside – fireplaces, hot mulled wine, the tinkling sounds of poetry and a golden sense of age. But it was all very foreign to me. My culture (not only Jewish but American) was louder, franker, more ambitious, less resentful. Where I came from, you openly tried to succeed, and could crow about how and what you did to “make it.” In fact, we cheered the rags-to-riches hero. England liked to dampen this enthusiasm. I got in over my head sometimes, and I remember feeling lost and bereft. My currency wasn’t worth the same in this place. But learning to adapt to another culture was intriguing. Travel can make you feel rootless and alone – but it can also make you soar. Best of all is when you come to feel at home in somewhere you once thought so strange. I did, eventually, come to that place. I think everyone at this site knows what you mean by that. So — do you still like “soaring”? Do you still like to travel? I love to travel, and still feel that it is the best way to understand the world – and the world inside you. Wherever I go, I try to be porous, to float, to leave my safety zone and almost pretend I live somewhere new. 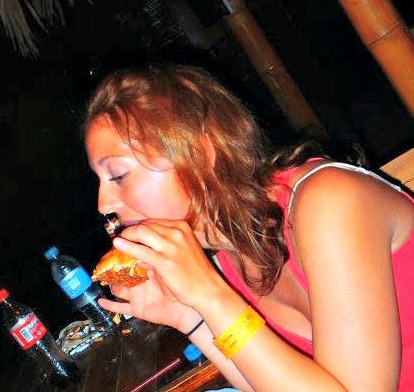 I eat the food, listen to the music, even try to speak the language. Being comfortable is not my main goal in life – it is to experience and learn. So I feel exhilarated as a traveler, even with the physical or emotional discomforts that come with it. Where is your home now — and where do you feel most “at home”? I feel most at home in my hometown, Manhattan, where all cultures are enthusiastically represented (it’s a world tour in itself). I also love to go to a small lakeside cabin, less than an hour from the city. You don’t need to be in Switzerland or Kenya to feel the overall majesty of the world. You married a non-Jewish man, an Englishman. How did you both adjust to the religious differences, as well as the cultural ones? When we met each other, it felt less like a culture “gap” than opposites attracting. The man in question had always been interested in the Jewish Bible, which he knew better than most. He confessed that he had always had “envious aspirations” towards the Jewish people. But in a real sense, even after more than 25 years of marriage, he is still very English (in attitude and accent), and his sense of being Jewish feels different to him than my own. He doesn’t have the weight of being “of immigrant stock,” or of being the child of refugees, castaways. After all, Americans tend to be intimidated by English people, and not the other way around. My husband has been embraced by this culture. After your own experience, what do you now see as the biggest challenge facing someone who is marrying into a different culture? The problem usually manifests in the broader family sense. Between the man and woman, there may be only perfect love, but you do have to add parents and, later, children to the mix. My parents were as horrified as his by our romantic “exogamy.” Although they came to love my husband, he was not the “nice Jewish boy” they had dreamed of. And then, when there are children, new questions arise — how do you raise them? That seemed easier in my case; my husband was now Jewish and wanted, as I did, to raise them in that tradition. But even so, his parents had to deal with the fact that we did not celebrate Christmas. Our children have to deal with the paradox that while they are Jewish, their English family is not. Our October theme is based around the tales of regret by those who travel. Do you have any regrets about traveling or studying abroad? What would you do differently — if anything? Unlike Edith Piaf, I regret so much. While my parents grew to love my husband, and – most movingly – his parents and mine grew to love each other, my going away caused immediate hurt. I still can feel guilty about my taking that step away. My parents were immigrants with a tiny remnant of a family. Yet, I had sailed off to explore the world, leaving them far behind. On the other hand, that is what children do. Mine are beginning to do the same, and I try not to hold them back. I also wish I had been more sensitive to my husband’s parents. They didn’t want me for their son, and I thought that made them prejudiced and “bad.” I mixed them up with those who had hurt my parents and millions of other Jews. Now that I have raised children, worried about whom they dated and how it would impact our family, I understand both sets of parents better. Youth makes us callous and cocky, and now, I hope, I am neither. 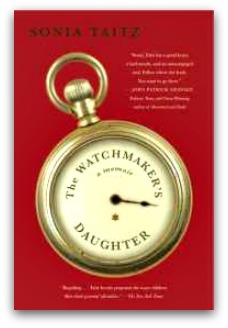 Could you tell us about your memoir being published today, The Watchmaker’s Daughter? Is this always something you’ve wanted to write? The memoir is something I had wanted to write since my parents died. For many years after they were gone, I couldn’t put pen to paper about anything. Still, thoughts about our odd and interesting lives began to form. Death gives a shape to existence – a beginning, middle, and a punctuated end – and I began to see a story coming through. A circle away and back home. The classic Ulysses story, but seen from the eyes of a little girl in a Jewish ghetto in New York City, and the larger world she longs to understand. After the voyage, the return. What made this book almost impossible to write was the duty I felt to be fair to everyone in the story, while doing justice to the story itself. This wasn’t my personal journal either – I wrote it as a coherent work that would resonate with others, regardless of their background. I needed to transmit what I had experienced and learned. I wanted to give the reader a tale of suffering, love, redemption, and renewal. You have also published a novel, In the King’s Arms, about an American Jewish woman who goes to England and marries into the aristocracy. How much of this was based on your own life? Did you find it easier to write the memoir or the novel, and why? The novel takes my real trip to Oxford and enhances it with far more dramatic plotlines. Many characters are invented, others are conflated from different people. Much of the drama that happens in that book never happened to me (although funnily, many people assume it did). I found both the novel and memoir enjoyable to write. Novels are fun; you can play with your characters and make them say or do anything you want. I love this freedom to create a new world. Memoirs are deeply rewarding in that emotional chaos is translated, ideally, into art. It’s a darker assignment, but a deeply satisfying one. Notice that I didn’t respond to the question of which was “easier.” I guess I enjoy intense engagement, which may be why I like travel, or the difficult task of writing. What audience did you have in mind for In the King’s Arms? Did you end up attracting those sorts of readers, and to which part of the story had the audience responded the most ? I felt the novel had a universal theme — young love, Romeo and Juliet, the sorrows of the broken heart. All sorts of people have responded to it in all kinds of ways. Some find it very English, comparing it to Evelyn Waugh. Some find it as Jewish as Philip Roth. Some treat it as a satisfying read, and others as a moral fable. Were you surprised at the book’s reception? The biggest surprise was that people responded to it at all. The book had almost been published 25 years ago, but the contract had fallen through, and I had thought it would never see the light of day. To see it come back to life, be read, and even garner critical praise, was the biggest and happiest surprise. Do you hope to attract another kind of audience with The Watchmaker’s Daughter? I hope to attract a bigger and more diverse audience than a small literary novel tends to. I am now decades older than the author of the novel, and I hope this book reflects that. You’re a very diverse writer, and have had some theatrical works produced at the Oxford Playhouse and at the National Theatre in Washington, DC. Could you tell us a little about them? The Oxford experience was one of the greatest ones of my life; I was given license to write a play that would be seen not only by the sophisticated body, but also by the London press. My husband-to-be acted in it (he was part of the Oxford University Dramatic Society), and it was an incomparable experience to watch him onstage giving life to my work. It was my first full-length play, my first public experience as an artist. The play at the National Theatre was part of a series that took place on Monday nights, when theatres are typically dark. Our troupe – author, actors, director — took the train down from New York, rehearsing all the way. The audience was great — the play was a farce about jealousy, kind of madcap and packed with complicated jokes and stage business – and they responded well to all of it. People who go to see new plays are adventurous, and people who’d go on a Monday night to see one they’d never read about are even more so. And finally: what next? Are you working on another book or play, and if so, can you tell us anything about it? My next book is a tragicomic novel based on a real public figure (a very famous actor), but the story is largely invented. Starting with his childhood, I create the background that made this man become an unbalanced anti-Semite. His father abuses him mentally and physically, and is a nightmarish tyrant. As a teenager, the boy falls in love with a Jewish girl from a good family, but something happens that affects both their lives. The novel is called DOWN UNDER, and it’s been a real treat to bring this story to life. We’re already looking forward to it! Thank you, Sonia, for being so honest and giving us such an insight into your life and your writing. We wish you and The Watchmaker’s Daughter every success. follow us on Twitter and look for a tweet prompt. We will announce all the winners in a couple of weeks! STAY TUNED for Monday’s post, Anthony Windram’s musings on films, horror and the displaced life! Images: Sonia Taitz author photo; The Watchmaker’s Daughter book cover. Passport: USA only — but I’m on my third edition! Overseas history: Japan (Yokohama, Kameoka, Nagoya): 1995-96; 1998-99; 2008-10. 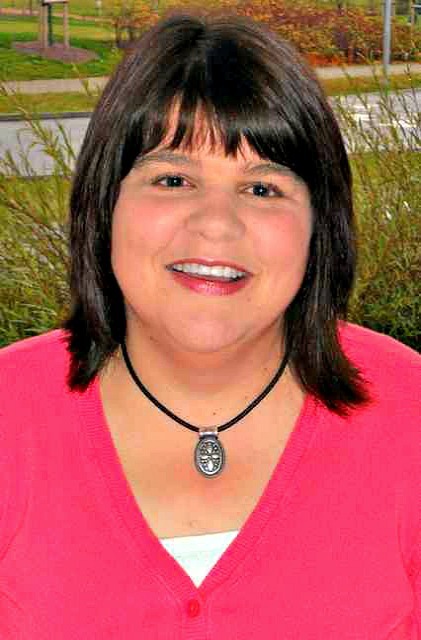 Occupation: Mother and author of the Cherry Tucker Mystery Series. I’m also working on a mystery series set in contemporary Japan. Cyberspace coordinates: The Expat Returneth — Sharing my life overseas, my life at home, and the other world that lives between my head and paper (blog); Larissa Reinhart: Writing mysteries and romance south of the sweet tea line (author site) @riswrites (Twitter handle); Larissa Reinhart (FB page); and Larissa Reinhart (Good Reads). What made you leave the United States to live in a faraway land? I’ve always wanted to live overseas. Before I got the chance to do it physically, I traveled through books — for instance, The Crane Maiden, by Miyoko Matsutani, and The Laughing Dragon, by Kenneth Mahood (I have passed them to my children). When I got older, I loved Elizabeth Peters mysteries, which are set in Egypt. My family is firmly rooted in Illinois, but was always interested in other cultures. My father was a history teacher, and I had a good understanding of geography and world history from him. I also had a grandfather who loved to travel. As a kid, I read his National Geographic collection and was fascinated by the countries he visited, particularly Egypt. He probably would have loved to have been displaced, but had to wait until retirement to travel. Tell me about the moment during your various stays in Japan when you felt the most displaced. 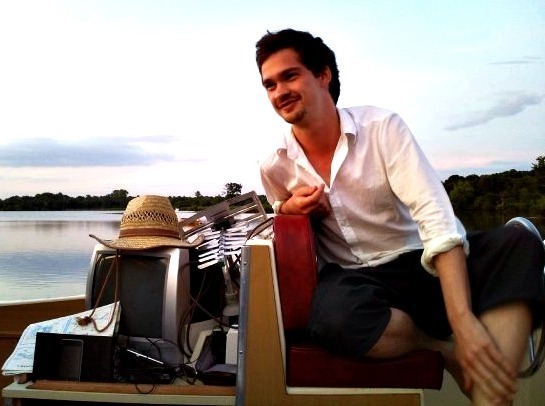 My husband had a scholarship from the Monbu-shō to study at Keio University, so I applied to the JET (Japan Exchange and Teaching) Programme — and ended up getting to Japan a few weeks before he did. I lived with a homestay family. They spoke no English. I spoke no Japanese. They were very sweet, but they swung between helicopter-parent smothering and leaving me for long periods of time alone in a tatami room. I had horrible jet lag and felt so isolated and helpless. Once I moved into an apartment, my jet lag abated and I began enjoying myself. I had traveled to Egypt previously — but hadn’t experienced that kind of debilitating jet lag that comes with a 13-hour time difference. It’s a killer! 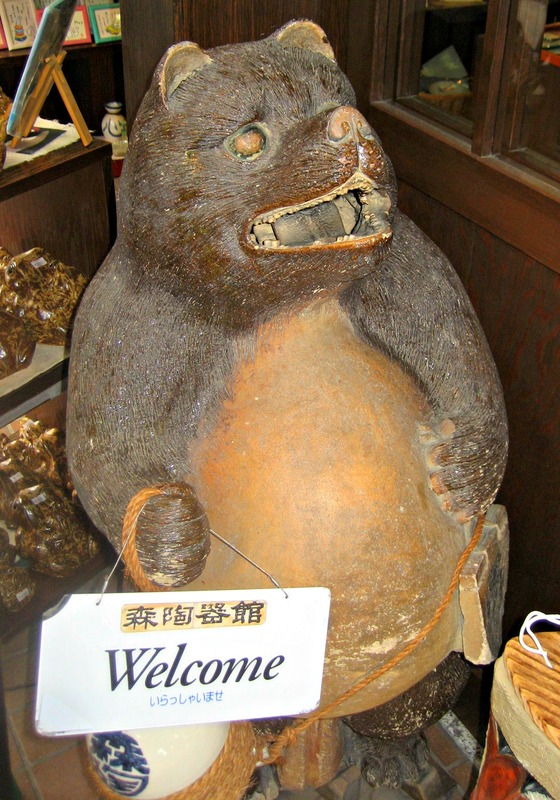 A ceramic tanuki (Japanese raccoon-dog). Japanese families and businesses keep them in front of their doors to welcome guests. It’s similar to the Maneki-neko (beckoning cat), but more fun because of their sake bottle and large kintama (golden testicles), which are meant to bring good fortune. Hmmm…moving right along: You are also invited to prepare one meal based on your travels for other members of The Displaced Nation. What’s on the menu? I like Japanese bar food, so we’ll have a meal based on that. Appetizer: Edamame (boiled & salted green soy beans) and a Grapefruit Sour to drink. My favorite bars in Japan will give you a glass of ice, seltzer, and shōchū (grain alcohol) and a half-grapefruit with a strainer for you to squeeze the juice into the glass. Really refreshing. Dessert: Japan isn’t big into dessert, so we’ll have a savory bowl of ramen instead. And maybe another Grapefruit Sour. Or two. Yum, you’ve brought me back to my own izakaya days… And now can you please suggest a Japanese word or expression for the Displaced Nation’s argot? Chuto-hanpa. It literally means half-measure, but is used to describe doing something half-assed. I love this word. We’re getting into a bit of a Halloweeny mood at the Displaced Nation. Tell me, did you keep the American Halloween tradition alive while living in Japan? We did celebrate Halloween in Japan with our children. It’s becoming popular there in terms of decorations and parties (we even found an American-type pumpkin for $20), but trick-or-treating is an oddity. You don’t request gifts from people — certainly not door-to-door. Our neighbors would deliver snacks in a plastic jack-o-lanterns to our house instead. One expat friend arranged a trick-or-treating excursion for the children as part of a Halloween party. But first we mothers delivered bowls of candy to the businesses and homes in the area so that, when we brought the children round to trick-or-treat, they would have something to give them. People probably thought we were crazy, but at least they found the children in costume adorable. It was on a trip to Thailand. My husband and I hung out on a beach at Koh Samui for a few days. To get back to the mainland, we had to hike across the island to catch a boat. We were proceeding along the dirt road, chatting…when I felt something grab my arm. Without breaking stride, I glanced down and saw a monkey, teeth bared, ready to bite me. Suddenly it flew off my arm, and I screamed. It had been chained to the side of the road, and was ripped away as it reached the end of its tether. Its vicious eyes and sharp teeth will forever be burned in my memory. That nasty monkey must have been someone’s pet. My husband saw it standing next to its stake before it jumped on my arm. Too busy talking, I totally missed it and walked within its perimeter. You can bet I have remained vigilant for monkeys ever since. I had a close call with some snow monkeys in Nagano, as well. I am not a fan. 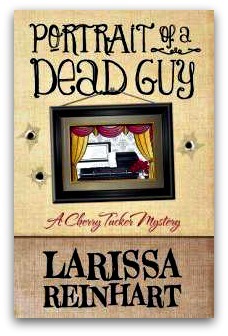 The first book in your Cherry Tucker mystery series is called Portrait of a Dead Guy. That sounds a little creepy. Is it? It’s actually a humorous mystery, but the idea of painting a coffin portrait is creepy even for my heroine, a sassy Southern artist named Cherry Tucker. However, she’s desperate for a commission, which is why she offers her services. The dead guy has been murdered, and his stepmother felt that a final portrait would be a fitting commemoration. Cherry ends up as another potential victim of the murderer because of her proximity to the corpse. That said, she does have one spooky scene at night in a funeral home, alone with the dead body, which ends badly. Painting a portrait of a dead man — how did you think that one up? In truth, coffin portraits are not all that unusual, depending on your culture. Many cultures use a portrait of the deceased with their memorialization. I know a family friend who was asked to photograph a coffin portrait to send to the deceased’s family in Asia. They would probably place the photo in a family shrine and burn incense for a specific number of days along with other rites. Tell me about your plans for the Japanese mystery series. I’m a humorous mystery writer, so I look at the lighter side of crime. Did you know that the Japanese love mysteries? I think it’s because they have so little crime. I have another Southern heroine for the Japanese series, which will bring an interesting cross-cultural twist. I love the interplay of cultures. Say, what is this thing about you and Southern ladies? Aren’t you an Illinois girl? Is this another displacement? 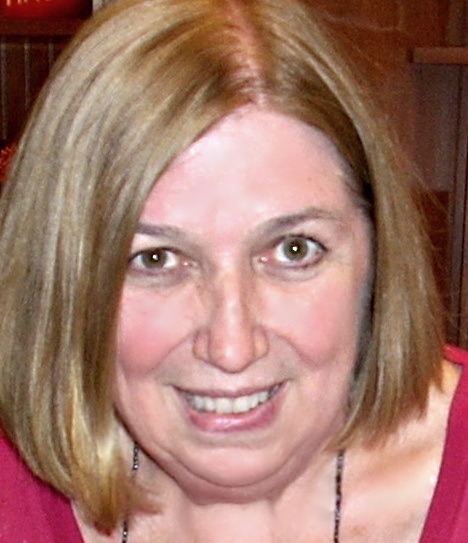 STAY TUNED for tomorrow’s post, an interview with another former expat author. 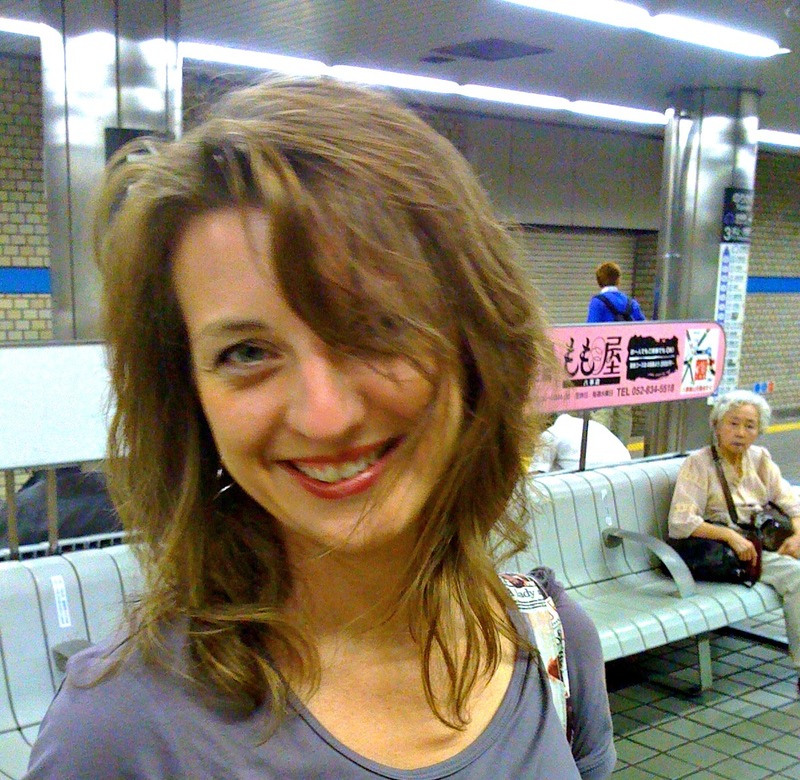 Images: Larissa Reinhart inside a subway station in Nagoya; her favorite tanuki (cute or creepy? ); her book cover.